To say that Paris is special is more than a bit cliché; the city has captured the imagination of many, and rightfully so. I'm certainly one of those people. I remember going to Paris with my family as a teenager and buying a Color Me Badd tape at the Virgin record store on the Champs-Elysées (yes, that is my first memory of Paris). I remember going to play softball against the American School of Paris, again as a teenager, and being set loose in the city with two of my best girlfriends and laughing harder than I ever had before. I remember the many trips taken with my sister to ring in the new year, which was always done at Bar Hemingway at the Ritz with the craziest characters in town. I remember spending my honeymoon there and my husband walking down the stairs of the Eiffel Tower in his bare feet after I held him to my family's travel motto: "If you can see it, you can walk to it." Paris holds a lot of fond memories for me. So it was important for me to first take my daughter to Paris at an age when she might, just might, have a lasting memory of the city. 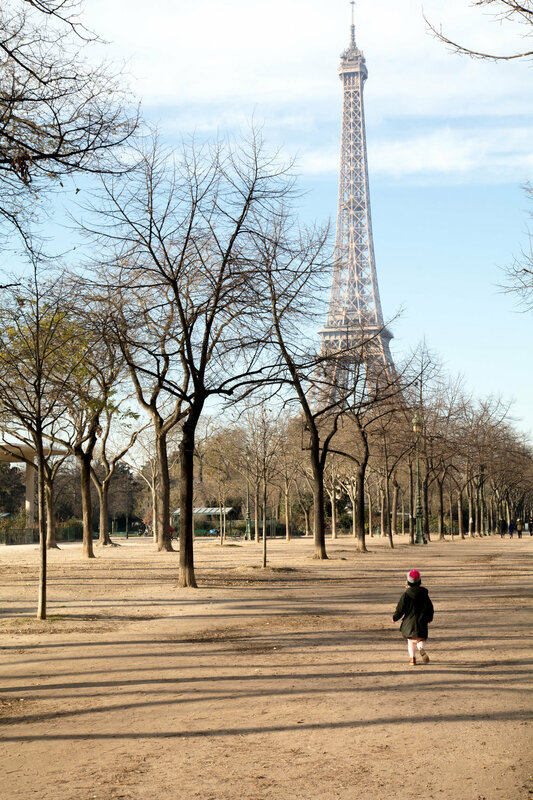 She is three and a half, and after months of talking about the trip, she was ready to go eat croissants, ride carousels, and see the Eiffel Tower. Turns out, I had a bit more than that planned, and after sifting through the photos, I decided I wanted to share our itinerary in more detail with you. I normally wouldn't post a play-by-play of any our trips, but this one felt different than most, so I thought I would try something different on the blog, as well. This is our first day. 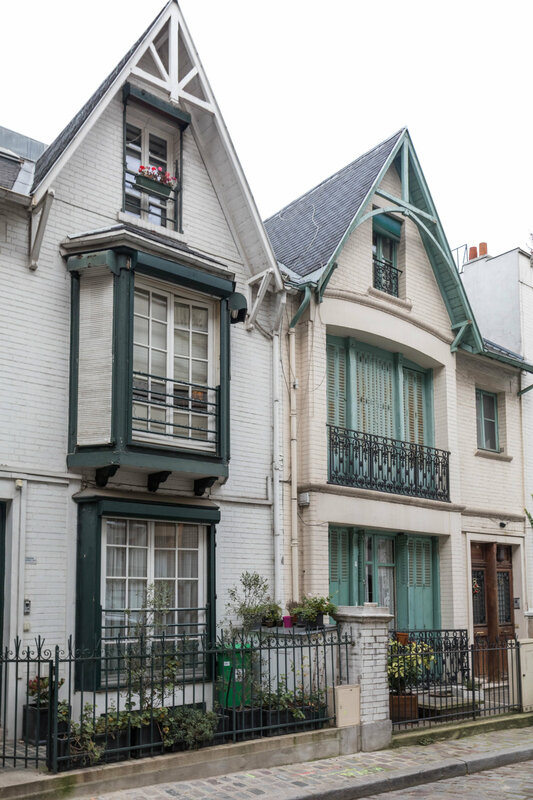 We stayed at an Airbnb apartment in Montmartre. This was an area of the city that I was desperate to explore more, seeing as my only experience with it had been visiting Sacré-Coeur and walking through the touristy schmaltz around la Place du Tertre. 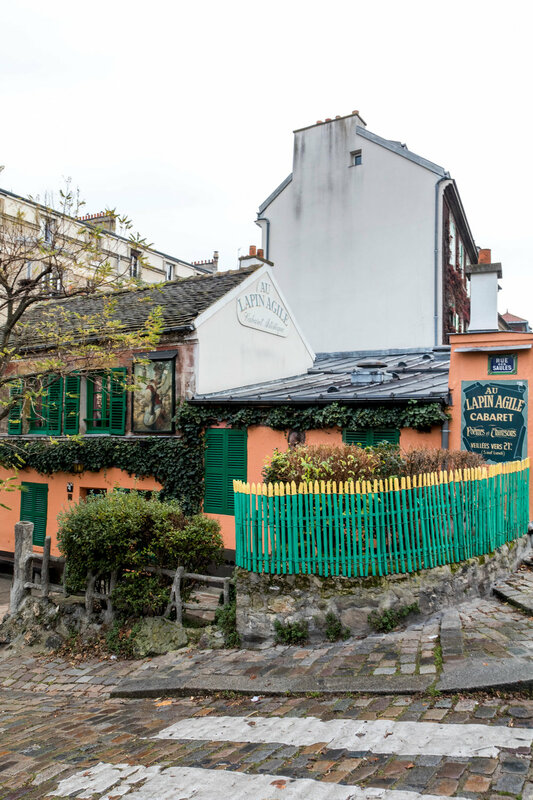 I'm glad we did because there is so much more to Montmartre - a charming neighborhood that feels so distinct from the rest of Paris. We started the day with croissants, coffee, and chocolat chaud at Soul Kitchen (33 rue Lamarck) and then ventured on to the first destination: Rue des Saules and La Maison Rose, because every travel photographer and Instagrammer worth his or her weight has a photo of that pink building! We then wandered down the cobbled sidewalk of Rue de l'Abreuvoir (pictured above, right) towards Villa Léandre, off of Avenue Junot. 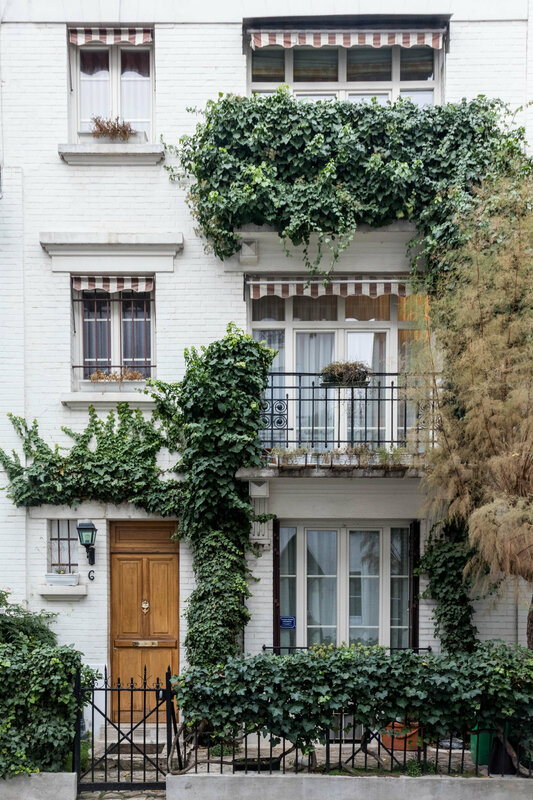 This street features picturesque homes not necessarily in keeping with the typical Parisian style; as someone traveling from England, the Anglo-Saxon influence was apparent, but it has a charm and beauty distinctly its own. 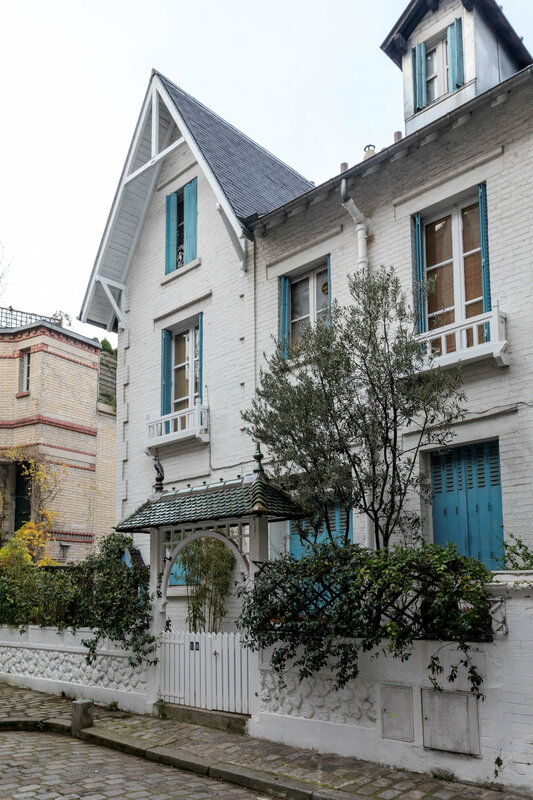 One of the highlights of Villa Léandre is a certain little restaurant that sits on the corner with Avenue Junot - Marcel. We didn't stop on this day but returned for an early dinner on our last night and were so pleased with the food and the service - the servers could not have been more kind by allowing us to sit and eat despite it being very near to closing time. And their sweet patience with my daughter's attempts at "merci" and "s'il vous plaît" was more than appreciated. Next, we ventured up to the heart of Montmartre, to the Butte. 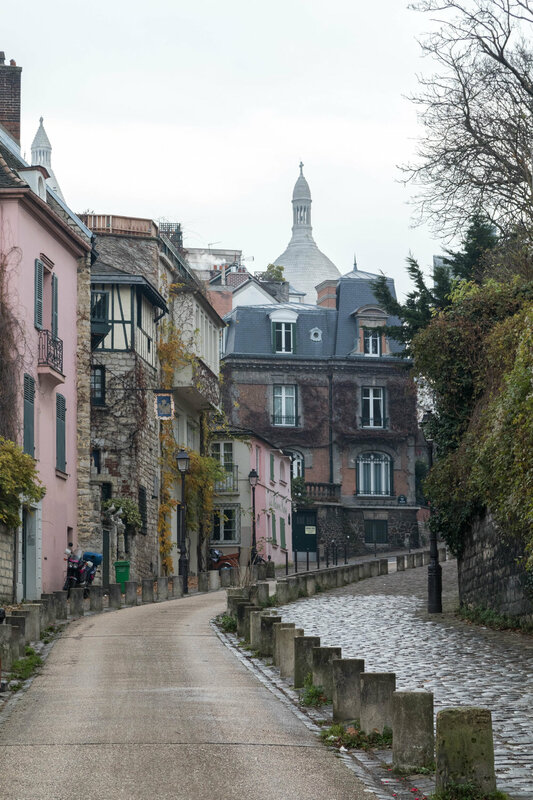 Although touristy, no visit to Montmartre is complete without a walk through this area. And as we approached, an elderly woman drew our attention to a little glimpse of the Eiffel Tower in the distance. Even though Paris was experiencing some of the worst pollution in a decade, it still looked beautiful. 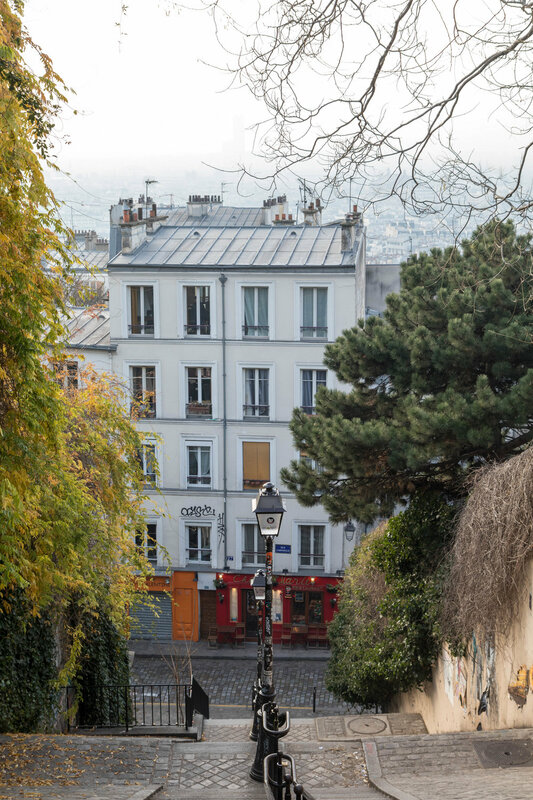 And of course, a glimpse of classic Montmartre wouldn't be complete without a view down one of the iconic staircases (with the city barely viewable through the smog beyond). We ventured down the steps in front of Sacre-Coeur, or rather I walked down the steps (once) and my husband and daughter ran down them (at least four times, I lost count). 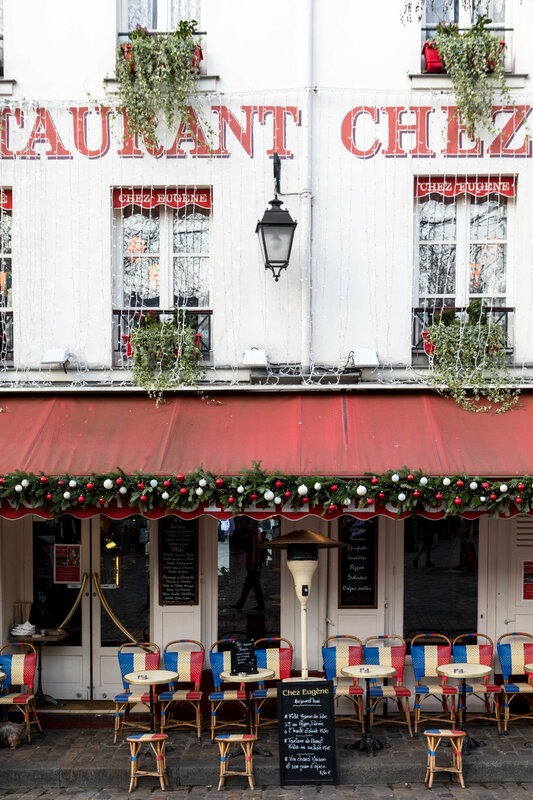 It was then on to lunch at Buvette, working our appetite up with a wander through la Place des Abbesses with its mix of bohemian charm and trendy boutiques. We stumbled upon the Le mur des je t'aime, and given that it was our wedding anniversary, we couldn't help but stop for a photo. A quick side note about Buvette, and more generally about cuisine in Paris and traveling with children. We were thrilled to find a number of high quality, non-touristy restaurants that served food continually throughout the day, something that is key when traveling with young kids (or, at least our young kid who rises early and is in bed by 8pm). Places like Buvette and Marcel are god-sends for parents like us who like to eat well when we travel and don't like hangry children; we didn't feel like we compromised our standards and she didn't feel like she was compromising her need to dictate when we eat! So, stomachs full, we ventured on. Of the three things on my daughter's list, so far we had only accomplished eating a croissant. Two items were left, and we decided to cross them off the list on the first day. Of course, at the end of the day, the carousel ride topped her list of her favorite things about Paris - I expected nothing less. And after a full day of walking, it was lovely to sit back and let her ride to her heart's content. We finished the day with a celebratory anniversary meal at Hotel Amour, recommended by the lovely Benedicte. Again, dining in a local's spot that is laid back and cool with a three year old (and at 6pm, nonetheless)!? We did not think it was possible, especially in Paris. Quelle surprise - a perfect end to a perfect first day in Paris. Stay tuned for Day Two, where we run around the Tuileries and explore the Île de la Cité and Le Marais.